Emma Stone and Andrew Garfield have sparked rumors of a romantic reconciliation after reuniting for a day out in London. The young couple was photographed enjoying a low-key stroll through the British capital's Covent Garden on Sunday, less than a year after the actors reportedly parted ways. In the images obtained by the DailyMail.co.uk, Emma is pictured smiling and laughing as she and Andrew chat away while walking side-by-side. However, the famously private stars were careful not to show any public displays of affection as they both kept their hands in their pockets for the duration of the outing. Representatives for the pair have yet to comment on the reconciliation reports. 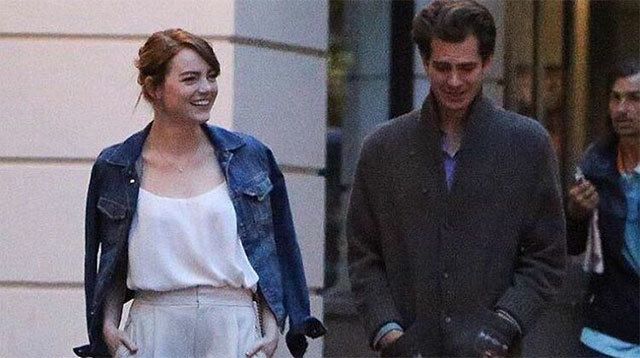 Emma, 27, and 33-year-old Andrew met and fell in love while filming The Amazing Spider-Man in 2011, but they reportedly took a break in April, 2015 due to their busy schedules. The actors were spotted back together last summer, but in October, a source told People.com the couple had ended their romance for good. "There was no drama... They still care about each other," the insider said. "They still have love for one another. They are on good terms with each other and remain close." Both Emma and Andrew have always avoided discussing their relationship in public, and when she was questioned about reports of their breakup in early 2015, Stone told the Wall Street Journal, "I never talk about this stuff for this exact reason—because it's all so speculative and baseless." "I understand the interest in it completely, because I've had it, too," she admitted. "But it's so special to me that it never feels good to talk about, so I just continually don't talk about it."